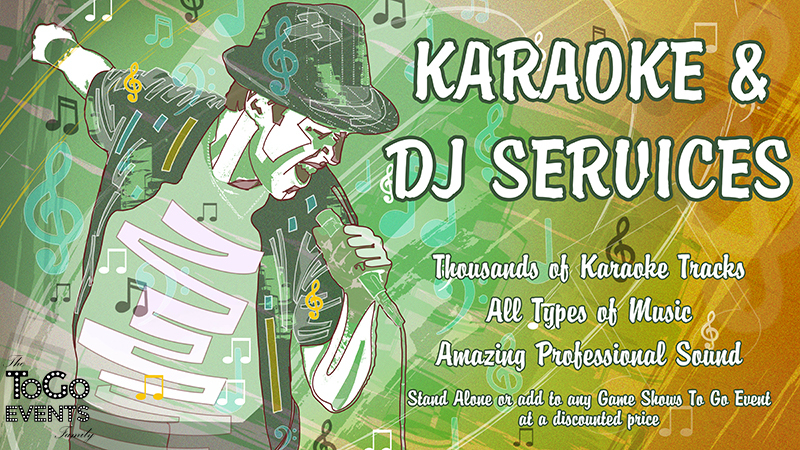 These items can be added to events at discounted prices! Contact Us for details on savings. All Game Shows and Non-College Events contact CJ Johnson or Gus Davis at 800-462-4424 ext. 1. Pucker Powder – or Sandy Candy – is edible sand art. It’s fun, colorful and deliciously sour and tart. 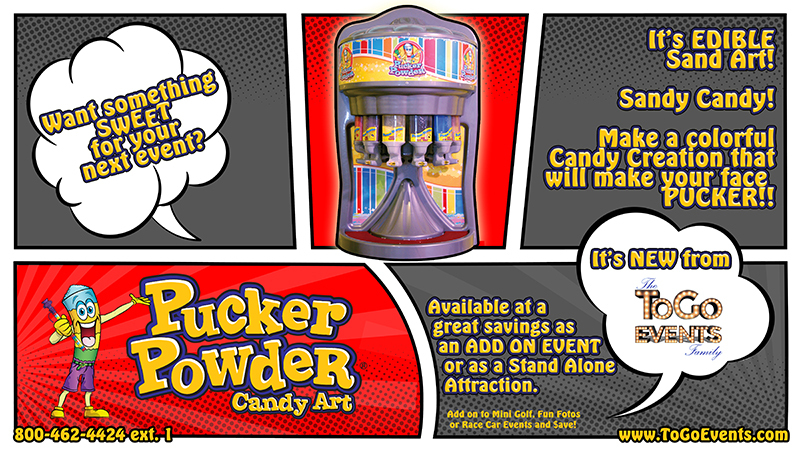 Pucker Powder is available as an ADD ON to ANY EVENT on this website. Jumbo Jenga/Tumbling Tower, Corn Hole, Giant 4 Across and more are available to make your party fun, festive and full of activities to keep your guests busy and having fun all day or night. 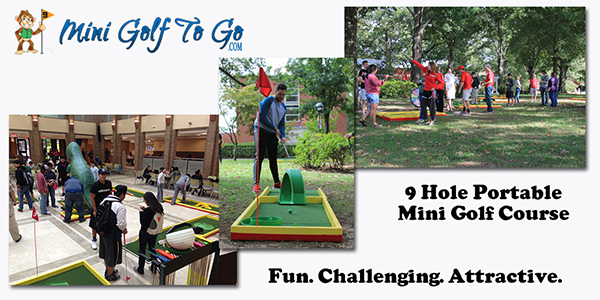 Best of all, these items are very affordable to add on to your Mini Golf To Go or Fun Fotos To Go events as they require nothing but a volunteer to look in on them periodically. 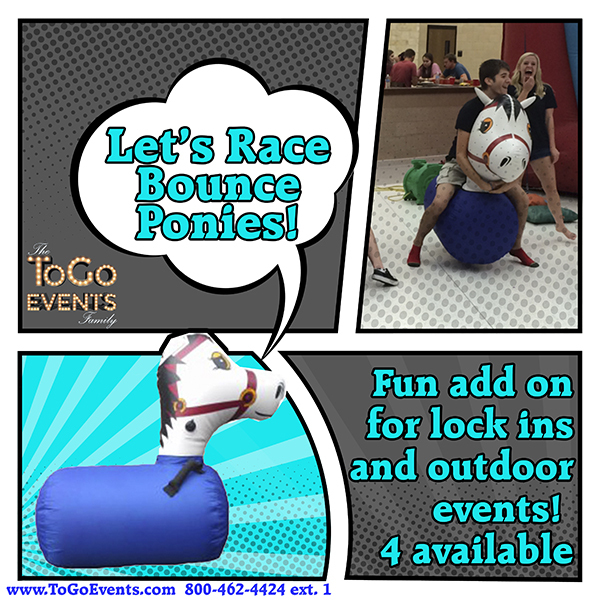 Bounce Ponies (we now have 9 available in various sizes) are great for outdoor carnival events, Lock In’s and any time that you have an energetic, physical group. People can race or just ride. 10′ Tall Hoop with a 3′ ball. 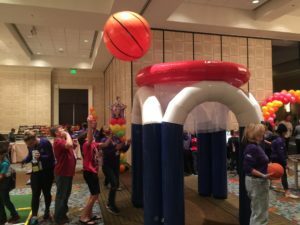 This attraction will both provide a fun game, but also give a great visual cue that you’re having an event! Kids young and old will have a great time with this oversized basketball set. Crazy Driver is a fun and addictive game with three different skill levels. Place the ball at the top of the maze and keep it on the playing surface all the way to the bottom. Once there – you’ve got to make sure it lands in the cup to score! Comes on a 4 foot table with red and white carnival style table covering to add color and pizazz to any event. You game becomes a part of the decor! Appeals to all ages, sexes and skill levels. 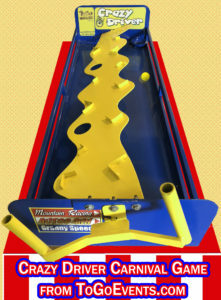 We have several carnival games and more are arriving regularly. Have a favorite? We’ll get it for you! Please note that we do not rent individual games (except as add ons), but instead offer packages that meet our minimums with delivery, set up, and when needed personnel. Mini Golf started as an add on event to our Fun Fotos To Go. It’s since grown into its own branch of the business, but you can still save when you book Mini Golf To Go and any Fun Fotos To Go event at the same event. 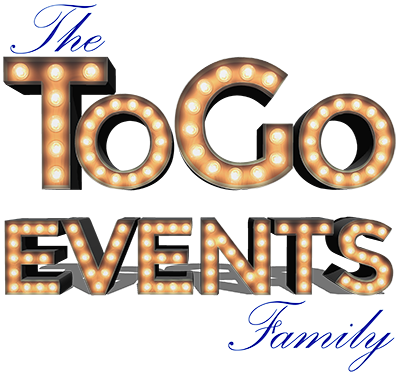 Contact Carol or Sheri at Everything But the Mime for College Events at 407.856.2412 or fill out a contact form and we’ll get in touch. Stenciled on with glitter applied these tattoos look great for up to a week! We can even make sure we have stencils with your school mascot or logo for a very minimal fee! Waterproof, Skin Safe and wildly popular. 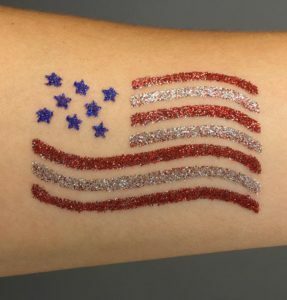 Glitter Tattoos are only available when combined with other events such as Mini Golf, Green Screen Photos, Race Cars To Go or combine several of our “add ons” to create an event that meets our minimum fee. Kim is great with kids of all ages and has a blast doing these Glitter Tattoos – and it shows.